A custom outdoor kitchen can be an amazing addition to your home, especially in a state as prone to gorgeous weather as Colorado. You have the chance to build your dream space with the experienced team at Artisan Outdoor Kitchens, whatever that dream space may look like. However, there are a few unique challenges that come with having an outdoor kitchen, and it’s your responsibility to make sure that your beautiful backyard space is safe. 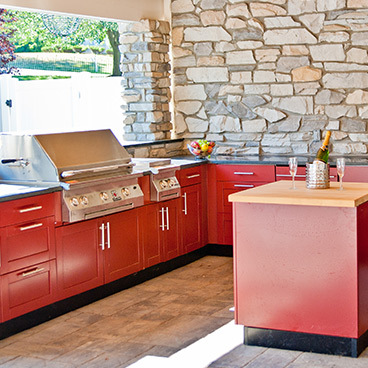 Read on to learn about the specific safety considerations you should keep in mind when working with an outdoor kitchen and call Artisan Outdoor Kitchens to work through your layout and design with a professional! Grilling outside is the perfect summer activity. You get to enjoy the sunshine and delicious food all at the same time. Whether your grill is built into your outdoor living space or free-standing, there are several fire safety measures you should take. For one, make sure your grill is a good distance away from your house, so any accidents won’t risk igniting the roof or siding. You should also be aware of other combustible materials that may be in the vicinity, like deck rails and trees. Your design team at Artisan Outdoor Kitchens can help you handle this when brainstorming the layout of your custom outdoor kitchen. One advantage of building your own outdoor space is that you can include storage for an emergency fire extinguisher in your plans. Better safe than sorry! If you run electric lines from your home to your outdoor kitchen, then there are a few more safety measures you should keep in mind. Any electric outlets built into your kitchen, for example, will be exposed to the elements. That includes rain, UV exposure, extreme temperatures, and more, all of which can degrade your components and lead to a dangerous situation. Artisan Outdoor Kitchens’ experienced technicians will know to use compliant electric outlets to mitigate this danger, but you should verify this for yourself in the design process. 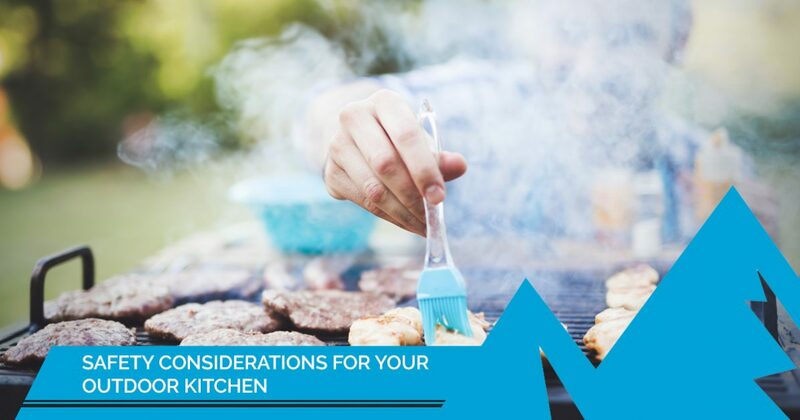 You should also double check that the electric cords and appliances you choose for your custom outdoor kitchen have Underwriters Laboratories (UL) outdoor ratings. This means that an independent, third-party organization has tested and analyzed those products and determined that they are safe for outdoor use. Don’t forget that you and your guests have to deal with the outside elements as well! Avoiding extreme weather should be a no-brainer. Even if you have some shelter over your outdoor living space, whether it’s an awning or a pergola, you should head indoors when extreme weather is headed your way. Lightning is dangerous as long as you are outside and unprotected. You should also plan ahead for days when you stay out after dark. 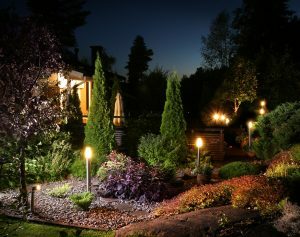 Make sure your pathways and stairways are lit, reduce tripping hazards, and perhaps rethink your landscaping to make it more friendly for nighttime navigation. You should also include plenty of light around the cooking area in your outdoor kitchen design. Your chef needs to be able to see what they’re doing, especially if they are playing with fire and sharp knives. Look for an upcoming blog post for ideas about building shelter and lighting into your custom outdoor kitchen! If you have kids, particularly young ones, you should teach them to respect the outdoor living space you built the same way they would the kitchen indoors. Remember to be responsible about the tools and supplies you use, too. Carefully protect any gas sources and put away knives and other sharp objects, and explain to your kids which items they are not allowed to play with. As you will have to clean your outdoor kitchen like you would any other cooking and living space, make sure that you lock up any potentially hazardous cleaning supplies. Kitchen cabinetry should be child-proofed if necessary. If you include these considerations in your outdoor kitchen design from the beginning, the Artisan Outdoor Kitchens design team can help you plan ahead and build the features you need. A custom outdoor kitchen built by Artisan Outdoor Kitchens is a dream made reality, but it also comes with responsibilities. Make sure that you, your family, and your guests enjoy your outdoor living space safely — be mindful of the weather, using electricity outdoors, and other precautions you need to take, such as keeping a fire extinguisher near the grill. 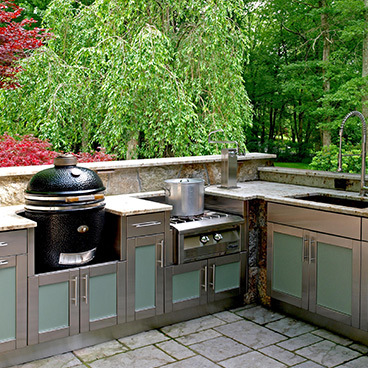 Our team here at Artisan Outdoor Kitchens has years of experience creating the perfect space for our clients, and we can help you build in the safety features you need to enjoy your outdoor kitchen for years to come. Call today to schedule your personal consultation!